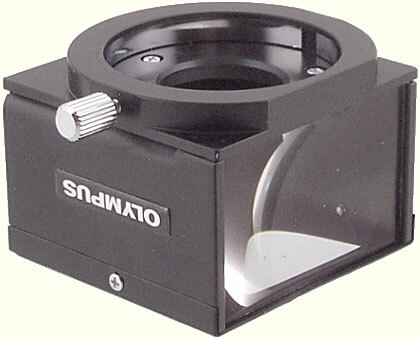 The Mirror Housings are designed to produce coaxial incident lighting with the bellows macro lenses, similar to the lighting used in metallurgical microscopes. 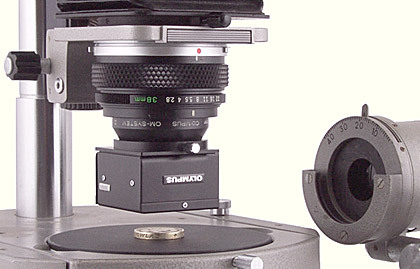 The Housings clamp on to either the manual or automatic versions of the lenses. 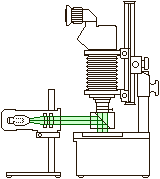 The Trans-Illuminator PM-LSD is then used to provide a horizontal, parallel beam of light that is directed onto the 45° semi-silvered mirror in the Housing, and from there down onto the subject. There are 3 models, the PM-EL-20 for use with the Zuiko Macro 20 mm f/3.5 lens and the Zuiko Auto-Macro 20 mm f/2 lens, the PM-EL-38 for use with the Zuiko Macro 38 mm f/3.5 lens and the Zuiko Auto-Macro 38 mm f/2.8 lens, and the PM-EL-80 for use with the Zuiko Auto-Macro 50mm f/3.5 lens, the Zuiko 1:1 Macro 80mm f/4 lens and the Zuiko Auto-1:1 Macro 80mm f/4 lens. The PM-EL-80 can also be fitted to the lens mount board of the Auto Bellows when a 50mm lens is mounted in reverse. The Trans-Illuminator Base XD-E is needed to raise the Macrophoto Stand VST-1; without the Base, the Trans-Illuminator PM-LSD cannot be set low enough to provide the necessary horizontal beam of light. Instructions were not provided with the Mirror Housings.